Casa Selvatica near Sayulita is located in the private and 24/7 gated community of Punta del Burro, 20 minutes south of Sayulita, 45 minutes north of Puerto Vallarta, 10 minutes south of Punta Mita and 5 minutes north of the fishing village (and new Marina) Cruz de Huanacaxtle - all located in Riviera Nayarit. It is the second to the last house in the Burros community, on almost an acre of land in a palm forest adjacent to a river bed and sits in front of one of the area's best surf beaches: 200 yards to the right of the house is the well known surf point called "Burros" and directly in front of the house is a very forgiving wave perfect for learners - with another mostly left break in between. The property consists of the main house in front, (1) Casa Selvatica, which has two bedrooms, one with a King bed, one with a Queen, both with their own private decks. In back are two cottages: (2) Casa Buena Suerte, a suite with a King bedroom, a living room with two sleepable couches and small kitchen. Down from that on the path to the beach is (3) Casa Lilia, an all marble studio with Queen bed and small kitchen area. One, two or all three can be rented. The price is determined by how many places (bedrooms) are needed and the time of year. And now, (4) the new Casa Cielo - located up on top above the Palm trees: it is half covered by a Palapa Roof with queen bed, a kitchenette w/ long marble counter, dining area, covered bathroom with onyx sink and an outdoor area with lounges and two person copper bathtub w/ shower. The property has many varieties of palm trees, over 25 fruit trees including bananas, papayas, lychees, cherimoyas, guavas, pineapples, passion fruit, avocados, oranges, lemons, etc., flowering tropical plants such as gingers, haliconias, orchids and more and all of this is constantly being visited by at least 30 varieties of colorful tropical birds. Punta del Burro is a private community located at 10.5 Kilometers on the Punta Mita Highway between Cruz de Huanacaxtle and Punta Mita. Punta del Burro is a small community of about 20 houses. It is not attached to a town or village and thus provides excellent security. It has a gate house with guards 24/7. The beach is very private with few people on the sand and around five surf breaks from the one end to the other. And to repeat, it is about 20 minutes to Sayulita and 10 to Punta Mita. For more information please use the contact form and email or call us and we will be happy to assist you. Wonderful place to stay in Mexico! My boyfriend and I stayed in Casa Buena Suerte for 2 amazing weeks. This property is truly a beautiful oasis. 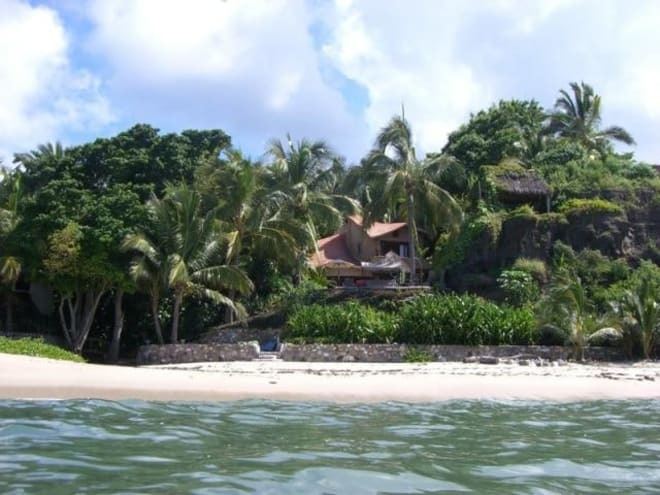 It is set in a well maintained jungle setting and steps down to a pristine beach. 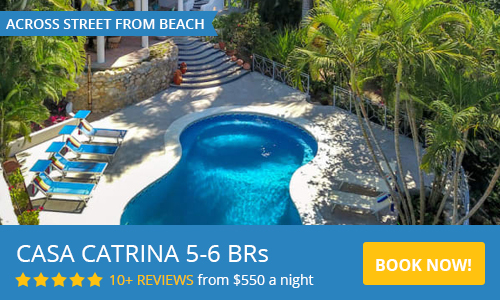 Casa Buena Suerte has everything you need including a beautiful bedroom with king bed, comfortable sitting area, nice bathroom, patio table and seats with a view of the beach. The Kitchenette is equipped with almost anything you need to make meals including small refrigerator, coffee maker, microwave, toaster oven, and plug in double burners with all the dishes and pans you need. The housekeeper comes in every day to clean, take out garbage, replace water, and make our beds. When there were others staying in the main house, we were able to have a big group dinner cooked by the housekeeper and it was delicious for a very reasonable price! All of the staff and the owner who helped us during our stay were also really generous and kind people. The beach in front of the house is semi-private in that there is a security guard patrolling it so there are none of the usual vendors you see elsewhere at other mexican beaches. You also can generally leave your stuff out and no one touches it. You can surf right in front of the house or just walk a few minutes and you are at the main surfing spot at Punta Burros. When we were there it was a little treacherous to play in the water as the waves can be big, and there is a rocky reef that you have to navigate. I was able to boogie board when the tide was low, and you can always walk down the way to the hotel and swim in their sandier beach. This place is a gem and we hope to be able to return soon! Absolutely incredible! Exceeded all expectations! Wow! Casa Selvatica and the accompanying 'Casas' were incredible. There is no place quite like this. You are situated right on the beach next to a couple surf breaks (Burros, and smaller break right out front). If you like to surf, then this is the place for you. Pablo, Jovana, Abel and Lori were such a pleasure to work with. So knowledgable about the area. Pablo did such a fantastic job of arranging cars, picking us up/dropping us off at the airport, and arranging Octavio to cook for us. Oh. My. Gato. Octavio (the chef) and his family cooked us the best meals we had while in Mexico. While Sayulita and surrounding areas were great, you cannot beat his meals. He buys all groceries, cooks the food, and manages all clean up. Perfect for our group of 11. Sal y Pepe (the cats) were also crowd favorites! Such personalities and they loved being pet and played with. Waking up to them curled up in bowls was such a sight! They also do an incredible job of keeping insects, mice and other critters out of the house. Punta del Burros is a beautiful spot. Secluded & Authentic. I would not want to stay anywhere else in the area. This is perfect. The pictures do not do this place justice. It blew away all expectations. Best vacation we have had in years! Fabulous in every way possible !! Owner Lori, Chef Ovtavio, Security Guard Ramon, Housekeeper Jovana and Pablo were ALL FANTASTIC !! Safe, clean, friendly, on the beach! Close to other towns for day trips if needed. We cant wait to go back and we are extending our stay!! Wow, what a paradise! First they set you up. Roberto picked us up at the airport, and patiently waited at the Mega Mart while we stocked up on groceries and got some cash. The house itself is a comfortable work of art, that is so well situated in the palms that you have all the privacy you could ask for, and can always keep cool from the shade. The other thing that contributes to the privacy is how the house sits perfectly up above the beach. The details in the house and guest house are so unique. That indoor / outdoor kitchen, and the outdoor sink, are two things that really stood out. Lori and her staff have all the details covered. It was our first trip to a foreign country with our 10 month old, and it couldn't have been more safe or perfectly suited for a family. Pablo was willing to help us out in any way. He and Roberto set us up with two play pen cribs,, and a baby chair, and we could totally trust Jovana to even baby sit for us a little bit (my wife and wanted to surf together a couple times). Pablo also set us up with a great little rental car, and it being my birthday, we hired Octavio to prepare an amazing meal, while looking over the ocean. I am a surfer, and I was impressed with their board selection. It covers all ranges - short boards, hybrids and long boards. They also have standup paddle boards. The breaks up and down the beach are awesome. The Burros right is world class, but I had an amazing left pretty much to myself, just across the channel that you paddle out. Pay attention to Lori's suggestions as well. "Tacos on the Street" is super tasty and fun, and "Margaritas" in Punta De Minta is a great little place right on the beach. This is a place we will continue to come back to no question. I miss our evening family walks on the secluded beach, the morning and evening surfs, and the warm and friendly staff. I almost forgot. We loved Mila, the German Sheppard and the two adorable cats. It is a special place! Almost private Surf Spot. Great accommodations! The Punta de Burros community is an excellent get-away-from-it-all location. The surf break is getting more crowded every year. It was a local's spot 5+ years ago. This trip I noticed that surfers were arriving by boat since access has always been limited. Anyway, the beach itself was empty. The flat reef reaches all the way to the beach so you have use of the booties if you want to walk out far enough to swim. The reef is not sharp but sandy, smooth, flat tops. House and casitas are very comfortable, clean and well appointed with great decoration and design. The patios and lounge areas are perfect for R&R. Palm shaded; sun if you want. Beach towels and toys are provided and/or available. I will definitely come back and recommend this location as not only unique and luxurious but a great value as well. We already own property in Sayulita and decided to 'get away' to Casa Lilia at Selvatica for a change of pace. It was magical, comfortable and unique. The space is spotless, first class with beautiful personal touches. There are many little surprises that I won't talk about - discover it for yourselves. It is situated in a 'jungle' on a pristine beach with giant surf the days we were there. We always enjoy watching crashing surf and surfers tearing through the waves and we were not disappointed. No one was on the entire beach but ourselves. We were enthralled from sunrise to sunset - what a view! Punta Burro is a safe, small gated community with beautiful homes - how nice that we could be part of that for a period of time. We were greeted by the manager who showed us around the property, the organic gardens and even gave us some limes off the trees and lettuce out of the gardens. Even if you already live in Puerto Vallarta area you owe it to yourselves to detune and enjoy the peacefulness and sound of the surf. We are not the 'condo' type so this was right up our alley. Enjoy! This is the most amazing property. It has everything you could ever what and more. We stayed there for 3 weeks. We were going to split it up but we ending up staying at Casa Selvatica for the whole 3 weeks and I am so so happy we did. It was my husband and I and our 3 boys. My older son stayed in one of the villa's and we stayed in the house. I can not even tell you how amazing this house is. Lori has a gardener Able that looks after the property 3 times a week. He is amazing!! She also has a house keeper that comes 6 days a week her name is Jovana. I loved have her keeping the place so so nice and clean. It gave me a chance to really take a brake and spend time on the beach with my boys. The property manager Pablo went out of his way to help us with anything we needed. The beach is amazing, right outside your door. My husband and boys surfed everyday. I felt like a queen there. It was the most relaxing vacation I have ever been on. I will be booking a month next time for sure. I am so happy I have found my Forever Family vacation destination. Lori has 2 dogs and a cat. We loved having them with us. They made us feel really safe. My youngest son who is 4 does not like dogs at all but Lori's dogs were so amazing my son loved them. He is not afraid of dogs anymore. I was not concerned to have them around my son which is something because I worry about children and dogs but Lori's dogs are so chill. Must be the ocean air. The house is one of the most unique houses I have ever seen. Made with so much love. The pictures and video of the property do it no justice ….don't get me wrong the pictures are beautiful but the house is so amazing that it is hard to capture it's beauty. I can't wait to go back. The property is so amazing. We can't believe how blessed we were to find it. This was my fourth trip to the are and my first stay at Casa Selvatica. The place is clean, comfortable, charming, and very close to surf. Lori and her staff were very helpful. Lori is more than happy to set you up with locals for surf, SUP, or snorkeling tours. We rented a car as we have friends in the area and have a few other surf breaks we like to visit, but if you opt for the chef service, no car is needed. I love visiting this area in late spring to early summer. The temperatures are in 80's (water temps in the low to mid 70's) so the weather isn't too hot. Casa Selvatica gets a nice breeze up on the hill and the two back houses are perfectly shaded should you find yourself ready for a cool nap after a day at the beach. Casa Buena Suerte was perfect for our group of 3. We enjoyed our stay and would be happy to stay here again. We just returned from our wonderful week at your lovely Casa. My husband's and my third visit but the first for the other 3 couples who joined us. Everyone had a great time and were delighted with the accommodations. We all got into the kick-back-and-relax spirit and we hardly left the property. Why leave paradise? We absolutely adored Chef Octavio and his wife Allie ... he's an incredible chef. We dined like royalty. Best of all were their great smiles - they got right into the craziness of our group (Mousetrap Reunion aka Ratones) ... complete with them donning mouse ears. Each meal was better than the next. We adored both of them. We hired them for both lunch and dinner - what a wise decision! Fresh fish - mango margaritas - incredible desserts! Yummy! We also had incredible whale watching right from the patios- so much activity. Again, we were delighted to be able to enjoy your place. Can't wait to book our next trip! Muchas Gracias to Lori and her team! surf vacation of a lifetime!